Rock band classes focus on learning musicianship, stage performance and the rhythmic techniques needed to play as a band. Under the guidance of our experienced band teacher, students learn songs of their choice. Rock bands focus on learning musicianship, stage performance, group skills and many rhythmic technique needed to play in a band. Learning to set a goal and work as a team is a lifelong journey and music is the perfect place for it. Not wanting to let their band mates down, students naturally want to PRACTICE MORE! 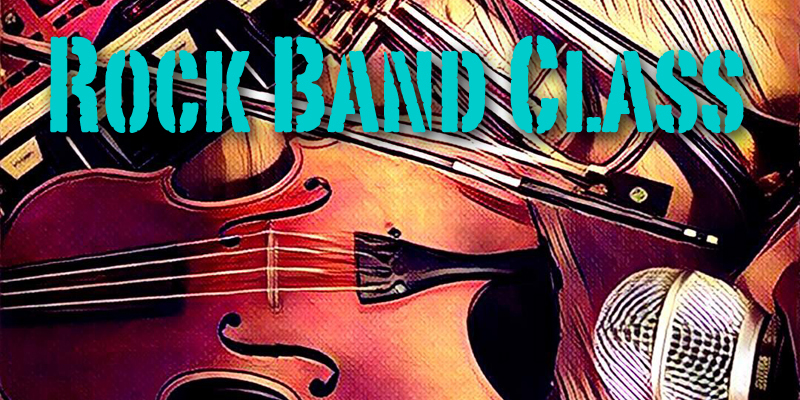 Rock Band Class gives students a unique and fun performance opportunity that allows them to express themselves, choose the songs they will play, and connect with other musicians their age as they build self-confidence playing as a band! Songs are arranged to match each student’s playing ability, resulting in music that is both challenging and achievable regardless of your level. Our new 8-week program plus a dress rehearsal class, will add more effective practices without interfering with March Break plans. A drummer will be booked to accompany the group for the show (included in the price). Show: Sunday, March 24, 2019 at the March Coffee House Show. Payable to: Russell Music Teaching Studios – Cash, e-transfer or cheque. This class will rock your kids' world! Spots go fast so contact us today to book yours!